OLYMPIA, Wash. (AP) — With their excess campaign cash, politicians in Washington state often return money to donors, forward it to their political party, or donate it to charity. Some, however, decide to use the funds for other things, such as alcohol, iPads, or auto repairs. Records show that since the beginning of 2007, Republican Rep. Mike Armstrong of Wenatchee has pulled $7,000 in campaign cash to buy clothing. Democratic State Auditor Brian Sonntag used the money to buy more than $1,000 in Mariners tickets, and Joe McDermott, a Democratic member of the King County Council, used $5,600 to pay for his tuition at Harvard. The spending, which possibly tests the boundaries of state law, is conducted with little scrutiny through so-called surplus accounts that rarely get public examination. The Associated Press identified hundreds of questionable expenses — from Democrats and Republicans — during a computer analysis of more than 500,000 spending reports obtained under public disclosure laws. Lt. Gov. Brad Owen spent about $760 from his surplus funds account at an Olympia liquor store, reporting the items were for various functions, dignitary gifts, and attorney dinners. Owen said drinks were served at after-hours events for state staffers and at other functions at his home. He said all of it was linked to his work in the office, noting that he wouldn’t have been able to purchase alcohol with government money. “If there was ever a question, we’d just use the fund,” Owen said. Rep. Armstrong said his clothing purchases were related to his work in the Legislature. Armstrong, who also works as external affairs director for the Port of Chelan County, said he doesn’t typically wear the apparel when he isn’t doing his work as a state lawmaker. “The only thing I wear suits for is the Legislature. And I’ll probably pick out a good one to be buried in some day,” Armstrong said. The state Public Disclosure Commission does not maintain explicit guidelines for what qualifies as an unreimbursed office-related expense, and it’s the burden of the officeholder to prove that an expense is related to office work, agency spokeswoman Lori Anderson said. Anderson said she would caution public officials about using the money for clothes, car repairs, or other potentially personal expenses because the items in question can’t be used for private activities and public office. An iPad purchased with campaign funds, for example, couldn’t be loaded with family photos or used to read a book on a plane, while clothes bought with the money could never be worn for personal events. “Whatever they buy has to be used solely for work,” Anderson said. Rep. Charles Ross (R-Naches) reported spending $1,250 on an iPad in 2011, even though the top model only costs $700. He followed that up with the purchase of another iPad for $900 just six months later. In 2010, Ross spent more than $1,800 for a new computer for what he described as his home office. Earlier this year, Ross pulled more than $2,000 from his account for maintenance on his vehicle. He did not return calls seeking comment. Ross wasn’t the only one to file for car repairs. Rep. Armstrong, GOP Rep. Glenn Anderson of Fall City, and Republican state Sen. Dan Swecker of Rochester also filed for similar expenses. And Armstrong wasn’t the only person using the account for clothes. So did Democratic state Sen. Brian Hatfield of Raymond, and GOP Rep. Ed Orcutt of Kalama and Swecker. Toby Nixon, a former Republican state lawmaker who is now president of the Washington Coalition for Open Government, said he’d like to see the state provide more explicit guidance on what types of expenses are allowable. He also said lawmakers who would be most impacted by strict enforcement are content leaving the Public Disclosure Commission with little staff to do proactive investigations, which leads to scrutiny only when questions are raised — typically by other partisans who are subject to the same rules. “That’s exactly the way the Legislature likes it,” Nixon said. Surplus accounts are such a little known sector of campaign finance law that Owen didn’t find out until recently that he hadn’t been following the rules for years. The lieutenant governor spent thousands of dollars from his surplus account without reporting the expenses, and he said nobody raised any questions about it until recently. “When we heard there might be a problem, I took the initiative and contacted the PDC myself and said, ‘What do you want us to do?’ ” Owen said. Owen, who is currently running for re-election, said state disclosure officials initially told campaign staff that expense reports were not needed, although surplus rules clearly say disclosure reports are necessary and the Public Disclosure Commission has for years maintained a frequently asked questions document that explicitly says surplus expenditures must be reported. Other campaigns have regularly submitted filings related to their accounts. Owen said he kept records of all his spending in part because he felt uncomfortable with the lack of disclosure, so he was recently able to document all the spending in recent years. In the new disclosure reports, Owen said he often used his account to pay for meals for him and his staff, including a $583 lunch in Seattle. He also spent money on gifts, including $263 at a winery near Walla Walla. Other expenses included travel, such as $1,500 for a trade mission to India. Even the donations to charity — an allowable use of surplus funds — can have a tangential benefit to politicians. Owen reported that several of his donations were for “event tickets,” including $500 to a nonprofit called Strategies For Youth. Owen was president of that nonprofit when the donation was given in 2009, and his wife was the only person drawing a salary from the organization — $6,800 for serving as vice president, according to IRS documents. Owen said there was never any issue about conflict of interest, noting that he’s always been open about how his office partnered with the nonprofit to reach out to kids. Recently departed state Sen. Joe Zarelli sent more than $10,000 of surplus funds to a charity run by his wife and that listed Zarelli himself as secretary. That money provided about three-quarters of the charity’s contribution revenue in 2008, according to IRS records. Zarelli did not immediately return a call for comment Monday. 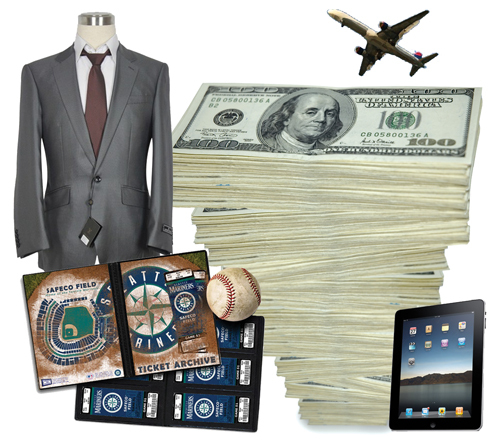 Sonntag, a dedicated baseball fan, said he typically gave his Mariners tickets away — either as an auction item, at church, or to staff members in his office. McDermott, the King County councilman, said the courses he took at Harvard in 2009 were continuing education. McDermott said the courses provided him tools to better serve in government and were more valuable than a new office desk or chair.